Below, we explain this transfer pricing method in more detail and explain when and how you can use it. Some of the terms used might be confusing at first. But with the example, it will become clear quickly. Before we continue, it is important to understand that the Transactional Net Margin Method is one of the five common transfer pricing methods used to examine the “arm’s-length” nature of “controlled transactions.” If these terms don’t ring a bell, we advise you to first read our articles What Is Transfer Pricing? and Five Transfer Pricing Methods with Examples. What Kind Of Transfer Pricing Method Is The TNMM? The Transactional Net Margin Method is a transactional profit method. A transactional profit method measures the net operating profits realized from controlled transactions. It then compares the profit level to the profit level realized by independent enterprises engaging in comparable transactions. 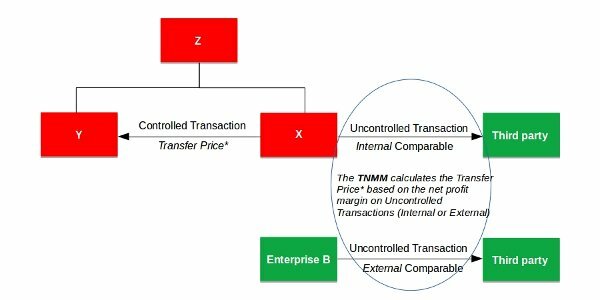 With the TNMM, you need to determine the net profit of a controlled transaction of an associated enterprise (tested party). This net profit is then compared to the net profit realized by comparable uncontrolled transactions of independent enterprises. This is a ratio of net profit relative to a base, such as “costs,” “sales” or “assets.” The net profit indicator that a taxpayer realizes from a controlled transaction, is compared with the net profit earned in comparable uncontrolled transactions. The Net Cost Plus Margin is the ratio of operating profit to total cost. As “Operating profit” usually Earnings before Interest and Taxes is used, or simply “EBIT.” Total cost means the direct and indirect operational costs without extraordinary items. The Net Cost Plus Margin basically measures the return on total costs of a company. By using this ratio, the comparison eliminates differences resulting from categorizing costs. An example is costs that can be either qualified as “costs of goods sold” or “operating costs.” This net comparison is not allowed under the traditional transactions method Cost Plus Method. That method uses information on gross level (and thus requires costs to be categorized properly). If the TNMM uses the Net Cost Plus Margin as net profit indicator, one often refers to it simply as the Net Cost Plus Method. This method is often used for low-risk routine-like activities such as manufacturing and provision of administrative support services. With this in mind, let’s look at an example. Company X provides administrative support services such as invoicing and bookkeeping. Associated enterprise Y asks X to provide invoicing services. Y thinks that they need about 1.000 hours of such services. X knows that the total cost of 1.000 hour of services is 125.000 USD. X wonders what transfer price it has to charge. This means that X should find the terms and conditions (here: the price) of a comparable transaction. There are many companies around that provide comparable services, including independent Enterprise B. X and B have exactly the same business model. Company X can look at Enterprise B to determine a good arm’s length price. How to determine this price? As mentioned, first we need to find the ratio of operating profit to total cost. The second step is to use the Net Cost Plus Margin to calculate the arm’s length transfer price. To calculate the transfer price one simply has to add the Net Cost Plus Margin to the existing total cost. We saw that the total cost of the services is 125,000 USD. If we add to that amount the Net Cost Plus Margin of 0.25 (31,250 USD) we end up with a transfer price of 156,250 USD (or 156.25 USD per hour). The Net Resale Minus Margin is the ratio of EBIT to turnover. It basically measures the return on sales of a company. By using this net ratio, the comparison eliminates differences resulting from categorizing sales under sales revenues or other revenues. This is not allowed under the traditional transactions method Resale Minus as that method uses information on gross sales level (and thus requires a detailed specification). If the TNMM uses the Net Resale Minus Margin as net profit indicator, one often refers to it as the Net Resale Minus Method. This method is often used for sales and distribution activities. Company X provides distribution services. Associated enterprise Y asks X to provide distribution services. This means that X should find the terms and conditions (here: the price) of a comparable transaction. How to determine this price? As mentioned, first we need to find the ratio of EBIT to turnover. The second step is to calculate the arm’s length transfer price. For this, you simply charge a price at which the Net Cost Plus Margin is not less or more than 0.15. The TNMM is a good alternative for the traditional transactions methods. The fact that multiple forms of net profit indicators can be used, makes this method widely applicable. It is therefore not a surprise, that this is the most used transfer pricing method. The TNMM can be helpful to assess the arm’s length remuneration of both low-risk routine-like manufacturing and services and more complicated functions like sales or distribution. The downside of the use of the TNMM is that the level of comparability of independent transactions in some cases can be questioned. This point is often brought forward by tax authorities. However, the fact is that the TNMM is often used exactly because other transfer pricing methods cannot be applied because of a lack of comparability and / or information in the first place. The Transactional Net Margin Method is one of the 5 common transfer pricing methods provided by the OECD Guidelines. It is a transactional profit method. The TNMM is the most used transfer pricing method. It is used for both low-risk routine-like manufacturing and services and more complicated functions like sales or distribution.